Immigrant rights advocates pitched their tents for an encampment outside the ICE offices in downtown Los Angeles on Thursday. The new liberal rallying cry raises more questions than it answered. Alexandria Ocasio-Cortez, the insurgent Democratic Socialist who won a stunning primary upset in New York last week, ran on this issue. And Democratic Sens. Elizabeth Warren and Kirsten Gillibrand — both considered possible 2020 presidential contenders — also took up the call. The new slogan, though, raises more political questions than it answers. What does "Abolish ICE" as a motto mean, anyway? 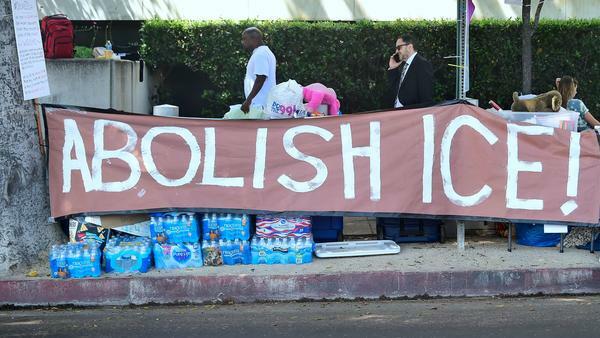 "Abolish ICE" sounds simple and straightforward. It's short enough to fit on a bumper sticker — as does "Build the Wall," or "Abolish the IRS." It symbolizes Democrats' opposition to Trump's immigration policies, particularly the separation of children and parents at the border. It's a shorthand way to remind lawmakers and the public that Democrats don't like how the president has demonized immigrants — whether they entered the U.S. legally or not. It also expresses the fear and outrage among immigrant communities who feel that ICE is terrorizing their neighborhoods. If it's a useful slogan for Democrats, why are Republicans thrilled? Democrats who use the phrase say it doesn't mean they want no enforcement at the border at all. But Republicans are making a big push to convince voters that's exactly what Democrats do mean when they call for abolishing ICE. Over the weekend and into this week, Trump tweeted about it repeatedly, saying Democrats want to get rid of ICE so they can have open borders and more crime. He tweeted Tuesday, "When we have an "infestation" of MS-13 GANGS in certain parts of our country, who do we send to get them out? ICE! They are tougher and smarter than these rough criminal elelments [sic] that bad immigration laws allow into our country. Dems do not appreciate the great job they do! Nov."
This is the president's No. 1 message for the midterms: Republicans are tough on the border and strong on crime, and Democrats are weak and will let hordes of immigrants come in illegally and "infest" our country. In an interview with Fox News that aired Sunday, Trump said he was thrilled that some Democrats were adopting this new rallying cry and signaled he would use it against them as often as possible. "I think they'll never win another election so I'm actually quite happy with it," he said. Why are Democrats divided about abolishing ICE? Until this past weekend, immigration was largely a political problem for Republicans. The GOP was badly divided over Trump's policy to end deportation protection for DREAMers — immigrants in the country illegally who were brought to the U.S. when they were children — and his now-reversed practice of separating children from their parents at the border. The majority of the country sides with Democrats on immigration in general. A Pew Research Center poll from June showed that Democrats had a 14-point advantage in handling immigration — and that was before the family separation issue exploded. A recent Gallup poll showed that 75 percent of Americans thought immigration was a good thing for the country. A majority of voters have consistently supported giving DREAMers a path to citizenship. Many Democrats think that turning the debate away from Trump's immigration policies and back to a fight over which party is stronger on border security is a loser for Democrats. It's why so many Democratic lawmakers refuse to jump on the "Abolish ICE" bandwagon. Even Vermont Sen. Bernie Sanders dodged the question, saying only that he wanted to "create policies that deal with immigration in a rational way." Illinois Sen. Tammy Duckworth said abolishing ICE wouldn't accomplish anything, since even without the agency, Trump would still be setting immigration policy. Although Warren and Gillibrand sided with the "Abolish ICE" push, California Sen. Kamala Harris, another possible 2020 contender, did not. Harris said she wanted to "critically re-examine ICE and its role." Many Democratic strategists were asking why — just when the Democrats were winning the immigration debate — they should adopt a slogan that could backfire on them going into the midterm elections. Is the debate over ICE's existence worth having? ICE is a massive law enforcement agency, created after the Sept. 11, 2001, terrorist attacks. It employs more than 20,000 people. It's responsible for homeland security investigations and the deportation of undocumented immigrants. Last week The Texas Observer reported that 19 special agents in charge at ICE's Homeland Security Investigations unit wrote a letter to Homeland Security Secretary Kirstjen Nielsen calling for the agency to be reorganized. The agents reportedly said that ICE is supposed to track down drug cartel leaders, child pornographers and human traffickers, but instead, the letter said, agents are spending time and resources going after undocumented immigrants, and the agency is becoming a "political pawn." The letter calls for splitting the agency in two — one part for homeland security, the other for deportations. It's hard to imagine such a proposal would go anywhere, however, in a political atmosphere in which immigration issues get oversimplified and weaponized.